Terraform is a powerful tool which allows you to build, change and version your infrastructure efficiently and absent any challenges. It supports a range of existing and popular service providers as well as custom in-house solutions. Terraform has a strong set of features, including Infrastructure as code, Execution plans, Resource graphs and Change automation. You can check out some common use cases for Terraform here. The Terraform tool integrates directly with StatusCake for the addition of new tests and modification of existing data, this means that it’s possible to run your StatusCake operations entirely through Terraform if you wish. Below you can see an example for basic test addition. This is going to be very useful if you already use Terraform for infrastructure management, and also constitutes a good alternative to using the API, rules and configurations can be pre-set with Terraform giving you an extra level of safety and validation on the data that you submit. The StatusCake API key and username will need to be sent with each request, so if you’d like to give this method a go, be sure to first grab the correct details from the User Details section of the StatusCake account. You can also find full details on how to configure Terraform with StatusCake here. Recently we’ve had a lot of requests for examples of how add new tests through the StatusCake API using the popular Postman tool. In this article we’ll take you through some of the steps required to get you going with this method, below you’ll find an example for each test type we offer, taking you through the process of adding a test. Now that all of our calls will carry with them the required authentication details, we can look at how to proceed in setting up the tests. Taking the fields from our API documentation you should enter the settings that you’d like applied to the Uptime test that you are adding, every time an uptime test is created you must at least include as a minimum: TestType, Checkrate, WebsiteName, and WebsiteURL. The call should be submitted as PUT. Page speed testing works similarly, and you can grab the fields that can be used from our API docs here. The required fields for this one are: name, website_url, location_iso, and checkrate. The POST method is required for this one. For SSL testing the PUT method should be utilized, and the required fields are: domain, checkrate, contact_groups, alert_at, alert_expiry, alert_reminder, alert_broken and alert_mixed. We’ve just added an integration with Mattermost which means you can now get all of your StatusCake alerts through to this application. 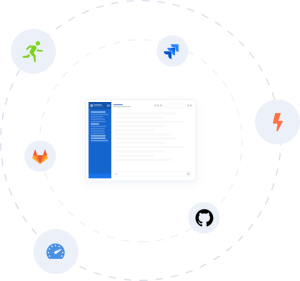 Mattermost is a deployable, cloud based, open source alternative to services like Slack, HipChat, and Pushover. The focus is on security and collaboration, with all of the usual essential team functionalities such as File Sharing, Custom integrations, threaded conversations and group messaging. As well as integrating Mattermost with StatusCake to receive your StatusCake alerts, it also plugs in to a range of other services to enrich the data your team receives, including popular apps like GitHub and Jira. Mattermost is free for small teams, for larger teams and Enterprises a small cost is attached to each plan. Native apps are available for Android, iOS, Android, Windows, Mac and Linux. If you’d like to read a little more about the new integration please check out our Mattermost Setup Guide, and feel free to get in touch with the team if you have any questions for us! Today we have released our new reporting tool which can be used to send out automated email reports for Uptime, SSL, Domain and Virus type tests. If you want to get stuck in right away, the new email reporting functions can be found within the User Details section of the StatusCake app. Here you can manage reports that you have created previously, and add new ones. All reports can be automated to go out at the time of your choice on a daily, weekly or monthly basis. Each report can contain it’s own sub-set of email contacts making it easy to ensure that the right data is going to the right people. 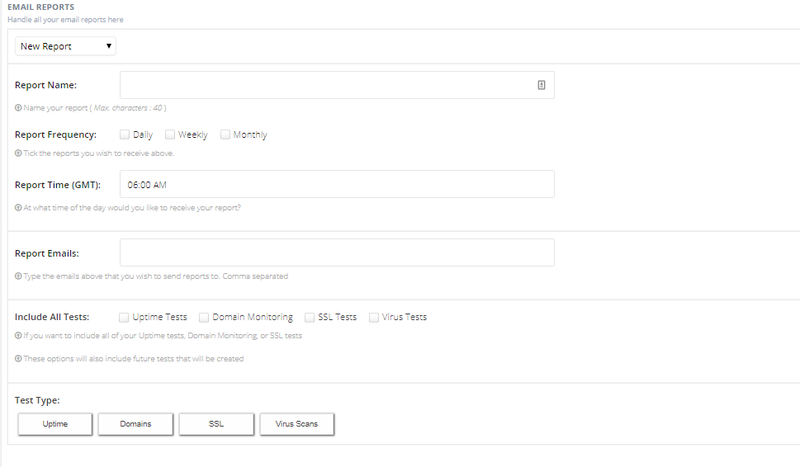 With this new functionality it’s possible for the first time to create a report combining the details of your Uptime, Domain, SSL and Virus scan tests in the same report making it much easier to see trends over the different methods of testing. Within the report the Uptime type tests will have data on the percentage of downtime experienced during the reported period, as well as average load time. For Domains and SSL you will be able to view any upcoming expiry dates that need your attention, and for the Virus Scan you will see a summary of any threats that have been detected since the last report. For anyone who set up automated reports with our previous reporting function – rest assured that these reports will still be sent as normal, the settings for these can still be modified at any time within the User Details section of the app. For many of our users reacting to downtime data sent from a monitoring system such as StatusCake.com is a 24 hour job, and the process incorporates many staff who will have varying responsibilities, and sometimes work quite different hours. This is particularly true of companies who run “follow-the-sun” with their global dev-ops teams picking up the baton from the last as their time zone starts its working day. 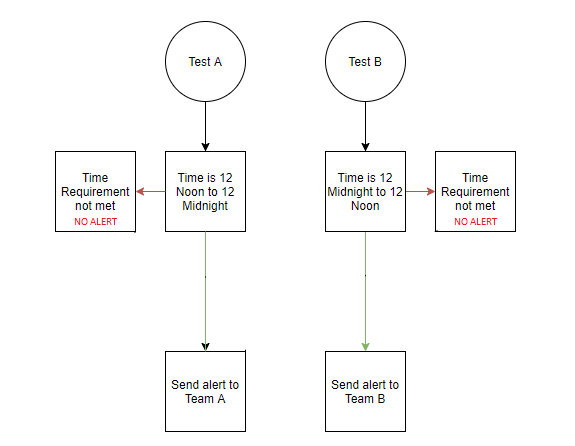 For this reason it can be very useful to have a method for splitting out which team alerts go to at different times. Today we’ll take you through a method for using our Maintenance Windows feature in this way. Team B takes over from Midnight to Midday. We want each team to only be alerted of downtime during their working hours. To achieve this you would set-up two tests in StatusCake; each test would be identical to the other, for instance in relation to interval check rate, confirmation servers and so on, however there would be two differences. Test 1 – The Contact Group would be set-up for Team A members and a Maintenance Window for Midnight to Midday set-up. Test 2 – The Contact Group would be set-up for Team B members and a Maintenance Window for Midday until Midnight set-up. This ensures that when the site goes down it will only alert the team on call. You can of course add as many teams to this following the same set-up process – e.g. for three teams add a third test and set the Contact Group and Maintenance Window according. We already have this use-case working for quite a few of our customers who don’t want to use additional third party integrations to handle alert scheduling. If you have any questions about this use-case, or indeed have any great use-cases of your own that you’d like to share with us then please let us know.